Townsend Wye is the most famous swimming hole in the Smoky Mountains. Or at least this most used. 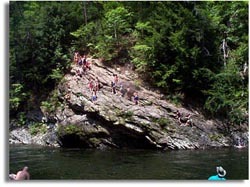 People jump from various levels of a large rock into 'Little River'. It's location, within sight of the intersection two of the Great Smoky Mountains National Parks busiest roads. There is a small parking area only yards from the swimming hole. The rock is located on the far side of the Little River from the highway. People line the shore on the opposite side of the river from the rock watching the swimmers take turns jumping from the rock. At the time this photo was takes there were about 50 onlookers watching as some of these guys jumped from as high as 25 feet. Directions: From Townsend Tennessee take hwy ?? towards the Great Smoky Mountain National Park. At ? miles after entering the park there is a parking lot on the left hand side of the road. This is the put in spot, the Townsend Wye.